On Friday 16th October, 2009 at 6.30pm, ABC TV broadcast an episode of 'Can We Help?' A National ABC television program out of Perth Western Australia. The show attempts to answer questions posed by their viewers. The show contained a segment about a Grandson trying to track down episodes of a radio program which involved his Grandfather, Colonel William Gray. He believed the series was called Colonel X and the family thought it was an ABC show. The segment told viewers about the search and about Colonel William Gray. Because of the huge amount of interest this program has generated, I will attempt to describe in a little more detail how it all came about. 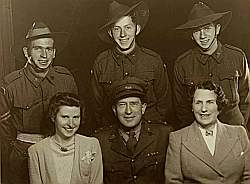 Radio Heritage, in New Zealand, who had received a request from ABC TV Perth, looking for information on a series called Colonel X.
check our Encyclopaedia of Australian Radio Shows database (EARSdb) to see what we had on the series. To my relief, we had quite a bit. intelligence agent the pseudonym, Colonel X, conceals the identity of a man who spent more than thirty years of his life in intelligence work of one kind or other for the British Government. His activities have taken him all over the world from Siberia to British Columbia, Japan and China and the hidden country of Tibet." It was first broadcast on 3XY Mondays and Wednesdays 7.30pm commencing 11th April 1949. It was certainly a good start. I asked Craig if he knew the series and was very surprised when he replied "I actually have two episodes of the series" and then handed me the Transcription Disc with episodes 03 and 04. I asked my daughter to email Radio Heritage and let them know that we had recordings and I would email ABC TV Perth when I returned home the following week. When I returned home and advised ABC TV Perth what we already knew of the series and that we had two episodes, the emails flowed back and forth very quickly. Moris and I started researching to fill the gaps in our knowledge regarding the Sydney broadcasts and letting the other members of the Australian OTR (Old Time Radio) Group know what we were looking for. episodes, he had episodes 01 and 02 which he made available. Working with my collection of Radio Magazines and the ABC Archivists we pinpointed the dates Colonel X was broadcast in Sydney. To Start with, it was an Australasian radio Productions (ARP) production. The actual series producer was well-known Australian Author, Moris West. Colonel X was Colonel William Gray, a Kings Messenger and career spy for the British. With prompting from the announcer/interviewer, experienced radio actor John Morgan, Colonel X (Colonel William Gray) would tell a story from his career. 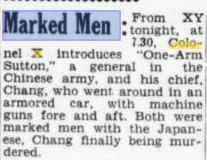 On 3XY Melbourne, colonel X commenced 11th April 1949 twice weekly, Monday and Wednesday 7.30pm and finished its run of 52 episodes 6th October 1949. On 2UW Sydney, Colonel X commenced earlier, 29th October 1948 to 20th May 1949. Unlike 3XY, 2UW broadcast the series only once per week, on Friday evenings at 9.45pm. So it looks like the series didn't run its full 52 episodes. Bill knew the radio series existed, because his Mother had several episodes on a cassette, until someone broke into her house and stole the cassette player with the cassette still in it. Bill hadn't realised that there were 52 episodes, they had thought the series was only about 4 episodes. Bill was convinced the series was on the ABC and that was where he had been enquiring in Tasmania where he lives. The State Manager of the ABC in Tasmania finally suggested to Bill that he should write to 'Can we Help?' and see if they could help, it was good advice. Thanks for the coffee Bill! some episodes of colonel X were found. They arranged for Bill to call in there next time he was in Perth on business and they would film his segment. We were sworn to secrecy. Episodes and label were sent across to them prior to Bill's arrival and the trap was sprung. The label shown on the right, is from the Transcription Disc held by Craig Nugent and is the same label we supplied ABC TV Perth for the CDs given to Colonel X's Grandson, Bill Lawson. On behalf of the researchers and collectors of the Australian Old Time radio group, I would like to thank ABC TV Perth for the service they provide in supplying a venue for their audience to write in for assistance. We have helped them several times now and judging from the response we have had from this show, there are a lot of people like Bill Lawson out there trying to fill gaps in their family knowledge, that crosses over into our hobby of documenting Australian Radio Production 1920's to 1960's. I would also like to thank Craig Nugent and Jamie Kelly who unselfishly made a part of their collections available to strangers. Without collectors like them, the sound recordings would be locked up in institutions, never to be heard and rarely to be accessed. Also a big thank you to Reg James of Grace Gibson Productions, copyright owners of Colonel X, who immediately gave permission for ABCTV to use the recordings in the segment and gave permission for us to supply copies to Bill Lawson for his family. Not forgetting Moris Sztajer, the man who had made sure Colonel X had made it into the Encyclopaedia of Australian Radio Shows database (EARSdb) in the first place, plus thousands of other entries. I got the fun part. Filming me for the segment because the others chickened out. Talking to everyone and sitting back taking the credit. The timing was right. I was undergoing Chemotherapy treatment at the time of my interview and the day after filming, my hair fell out! The last thank you is for all the viewers of Can we Help? who contacted us with more questions relating to their family contacts with radio, several of which we are currently working on and a couple we have already completed. They provided scans of pictures and documents from family albums which will be added to EARSdb. Several other people have passed on information that have led to discovering other documentation and recordings and it is appreciated. As you can see, we also have an episode of Colonel X for you to hear. That is a new addition to the page. Reg James on behalf of copyright owners Grace Gibson Productions has given us permission to allow you to listen to episode one. It is greatly appreciated that Reg James has done so. Further on in the site you will see a link to the Grace Gibson Productions online shop and I hope you use it to show your appreciation. could actually download the episode or view it online. Unfortunately the ABC have removed the shows from their website as the series has ended. I have made my copy available here and cut it down to the relevant section. I don't know who at the ABC to ask for permission, but will remove the video if they want me to.